The hardest job in the army isn’t dodging bullets, or hauling equipment through stifling heat, or driving a truck down a road littered with strange lumps that might be a concealed bomb. It’s something far more personal: It’s telling those left behind that their son, daughter, brother or father isn’t coming home. Oren Moverman’s debut feature film is a powerful study of how human beings deal with this incredibly difficult task. Ben Foster plays Staff Sergeant Will Montgomery, who has just found out he won’t be returning to the front line to serve with his comrades. Instead he will become part of the Army‘s casualty notification service, whose job it is to inform the next of kin of their loved one’s death, before they have a chance to learn it from the media. His supervisor is Captain Tony Stone, played superbly by Woody Harrelson. Ben Foster’s character is a hard man, but he’s been made that way by the horrors he’s seen in the war. His more human side only comes on display later in the film, when he breaks the rigid rules set down by Stone and tries to comfort a grieving mother and father, the best way he can. Things become increasingly complicated when he is drawn into a relationship with Olivia (Samantha Morton), who has just lost her husband. Stone’s frustration at having not seen any real battlefield ‘action’ is obvious right from the start; he has a lot of pent up emotional energy, and he releases this in less than productive ways. At one point in the film he tells Montgomery that every funeral of a soldier killed in action should be put on the news, so people become used to it. And we get the feeling that that’s what he himself has done; desensitised himself to the shock and grief of his work. All three leads are fantastic in their individual roles; all are broken, realistic, fragile characters who we can relate to. For me it was Harrelson’s performance that stole the show; his tough guy attitude is only a front for the regret and frustration laying underneath, and the rigid rules he has set in place for dealing with the next of kin seems the only thing holding him together. Also, keep an eye out for a moving performance by Steve Buscemi as a bereaved father. This movie was filmed in wide-screen format, for the purposes of being able to include all the characters on screen during the frantic ‘notification’ scenes. The image quality is clean and sharp, with vivid colours. The musical soundtrack is left very sparse; there are entire scenes without music, and then we are subjected to stabs of angry grunge/rock when Foster is alone in his apartment. It’s all very effective, and heightens the emotional impact of the film. Going home: This behind the scenes Featurette discusses the politics of the film, an in-depth analysis of the lead characters, and the reasons behind the choices of costumes and sets. Notification: A documentary about the notification process, featuring interviews with Army personnel as well as real people who have lost loved ones serving overseas. It’s gut-wrenching to watch, but it’s a fascinating insight into a truly horrible job. Q&A with the cast and crew: A panel interview with director Oren Moverman, stars Woody Harrelson and Ben Foster, and co-writer Alessandro Camon. As well as these features, there are the standard theatrical trailer and commentary provided by the cast and crew. 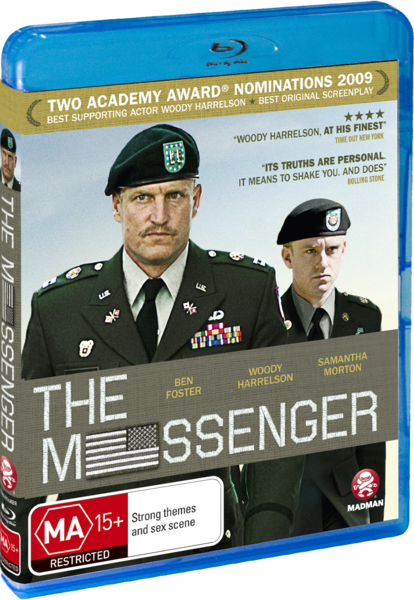 The Messenger is a war movie set on the home front. It’s difficult to watch, for the fact that it is emotionally unpredictable. Each time Stone and Montgomery get out of their car and begin the walk to another family member’s door, you dread what they’re about to face- whether that be abuse, or denial, or a complete physical breakdown. It’s moving, shattering and compelling. Expect great things from director Oren Moverman in the future.